Authors: Insara J. Jaffer Sathick, MBBS and Gauri Bhutani, MBBS. 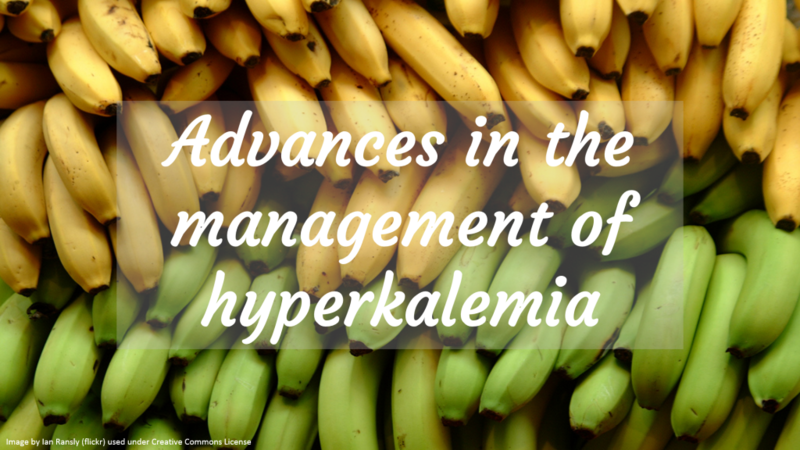 The past month has seen two exciting developments in the management of hyperkalemia. Studies published recently in the NEJM and JAMA have sparked a renewed interest in this area. We may soon have two novel drugs in our arsenal to manage hyperkalemia namely, ZS-9 and Patiromer. Sodium Zirconium Cyclosilicate (ZS-9) is an oral non-absorbable selective cation exchanger that traps potassium in exchange for sodium and protons, an action that is touted to be active throughout the GI tract. It is reported to have 9 times more affinity for potassium as compared to Kayexalate. Two double-blind, placebo controlled phase 3 trials were published in NEJM and JAMA in the last month. The study by Packham et al published in the NEJM randomized 753 outpatients with potassium of 5.0 to 6.5 mmol/l to ZS-9 or placebo three times a day for 48 hours. Patient who responded with normalization of potassium were randomized to receive ZS-9 (maintenance phase) or placebo once daily on days 3 to 14. Patients with severe hyperkalemia with potassium levels >6.5 mmol/l and EKG changes were excluded. A significantly higher dose dependent decline in potassium was seen in the ZS-9 groups (dose of 2.5g three times a day and higher) as compared to placebo. At 48 hours, the mean reduction was 0.7 mmol/liter for the highest dose of ZS-9 (10g) (P<0.001), compared to mean reduction of 0.3 mmol/liter in the placebo group. Normokalemia was maintained during the maintenance phase in the ZS-9 groups (in doses of 5g and 10g one time daily). Rates of adverse events were similar as compared to placebo with diarrhea being the major event. Hypokalemia (<3mmol/l) was not seen. Diet was not modified in the patients studied. Hence it is difficult to say if there is an additional benefit that cannot be gained from dietary measures alone. One potential benefit of this agent, therefore, could be a more liberal potassium intake in patients with kidney and heart disease (taking RAAS inhibitors) who formed a considerable proportion of the study population. It is difficult to clinically translate the modest reductions in the potassium levels seen with ZS-9. Duration of the study is too short to draw any long-term conclusions. Additionally, the authors do not provide details on patients with treatment failure (persistent/recurrent hyperkalemia). Singh et al also published the 4 week long HARMONIZE randomized clinical trial in JAMA comparing ZS-9 to placebo with similar results. The OPAL-HK investigators studied the efficacy of Patiromer, a polymer that exchanges potassium for calcium in the distal colon in a single-blind study published in the NEJM. They included patients with CKD stages 3 or 4, potassium levels 5.1 to 6.5 mmol/l, and were receiving one or more RAAS inhibitors. 76% of the patients had normal potassium levels at 4 weeks after initial treatment with Patiromer. This was followed by 8-week placebo-controlled, randomized, withdrawal phase during which hyperkalemia recurred in 60% of the placebo group vs 15% in the Patiromer group. The major adverse effect was constipation. These newly published studies are a welcome development in the treatment of hyperkalemia. However we should exercise caution in using these novel drugs in patients with severe hyperkalemia. They are more relevant for the outpatient hyperkalemic patient with no cardiac dysrhythmias. Patients with mild to moderate hyperkalemia who are not able to tolerate ACE/ARB therapy are the most likely to benefit. Patients with advanced renal failure or severe hyperkalemia are best treated with diuretic therapy and dialysis.